Ken Griffey Jr.’s nickname “The Kid” was originally bestowed on him because of his remarkable athleticism and achievements at an early age. But those closest, who have watched him take the field and play with “child-like glee” throughout his 19 year, deadlock Hall-of-Fame career, will tell you he still acts like a kid playing a man’s game. A big, lanky, powerful kid, who just happens to be the greatest home run hitter of his generation! And, to Junior tell it, having fun has been the key to his continual success…the magical tonic that fuels his seemingly effortless swings that have carried high-flying home runs into the seats of so many major league parks. 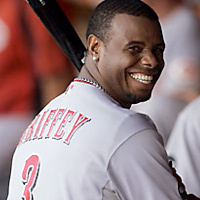 Editor's Note: On July 31, 2008, Ken Griffey, Jr. was traded from the Cincinnati Reds to the Chicago White Sox, where he will "have fun" hitting long balls into the outfield stands of U.S. Cellular Field on the city's southside with fellow 500 Home Run Club member Jim Thome. In fact, Nike created a print ad that ran started running the month before his 600th home run came on June 9, 2008 in USA Today, the Seattle Times/Post Intelligencer and the Cincinnati Enquirer, commemorating his pursuit of mystical No. 600. 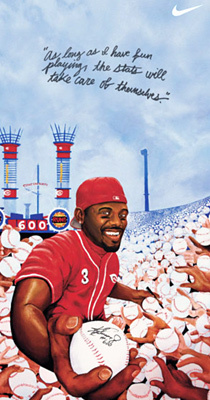 “As long as I have fun playing, the stats will take care of themselves,” read the animated ad featuring Griffey Jr. surrounded by fans holding baseballs for him to autograph. When he touched home plate, Griffey waved to his wife, Melissa, and the rest of his family seated several rows behind home plate. When he reached the dugout, one of the first to greet him with a hug was his 14-year-son, Trey, but his Reds teammates soon mobbed him with hugs and high-fives. An announced crowd of 16,003 fans gave Griffey a standing ovation, and he appeared from the dugout for a curtain call. "The fans appreciated it. They were going to applaud until he came out. That's typical of Junior,” commented Reds manager Dusty Baker, who has managed the last three players to achieve the milestone: Barry Bonds in San Francisco, Sammy Sosa in Chicago and Griffey. "It's awesome every time you see a milestone like that. It doesn't take away from the others. It adds to it [the legacy]." Clearly a seemingly healthy and rejuvenated Junior is having lots of fun these days because the 600 home run mark came and went in a blur - on June 10, 2008 - less than four years after he breezed through the 500 homer plateau on June 20, 2004…and they just keep coming. Since then he has hit eight more to bring him to within a single long-ball of Sammy Sosa’s career total of 609. "I got a [congratulatory] call from Willie, and then I got a call the next day from Hank," Griffey said. "They just said, 'Keep going, have some fun. Just be you.' I think that helped me a little bit having those guys make a call to me and try to settle some of the nerves down." So what next for Junior after he puts Slammin’ Sammy in the rearview mirror? Willie Mays’ 660…Babe Ruth’s 714…Hank Aaron’s 755…or even the all-time title of 762 held by Barry Bonds? The sky’s the limit for this fun-loving man, who is still a kid at heart. "You can't predict home runs and when they're going to come," Griffey summed up recently. "Just let them happen."